People have been using internet-based services like Facebook, YouTube or Google in increasing numbers and advertisers haven’t failed to take notice. Honestly, it would take a truly blind man living under a rock to not realize that every internet user is a potential customer. It would also take an extremely inefficient company to not try and tap into this massive ever-expanding market. When billions of people are placing their attention on something every day, you bet someone will think of placing an ad there. As a direct result, companies started selling ad space on their websites, making advertising part and parcel of our daily Internet endeavors. Visiting a website will almost always result in an invasive, flashing ad greeting you and informing you that something you most likely don’t need exists. The mentioned companies have lately realized that such system isn’t exactly perfect in drawing and keeping peoples’ attention; most users simply ignore and get annoyed by these ads. This led to less people clicking the offered ads, less people buying the advertised products and less money being made. Naturally the companies decided to step it up a few notches; they started collecting people’s private data and internet searches while consulting some of the best behavioral scientists out there, in order to fine-tune the ads that were on display. The importance of this attention economy becomes clear when you see how companies are ready to commit borderline crimes in order to “hack” into the secrets of capturing the attention of the average consumer. Remember that time Facebook asked you about your interests or recommended you a page to like? It wasn’t to make sure your new friends know how to break the conversational ice. However, this also ultimately proved to be avoidable as people started installing adblockers and stopped giving away sensitive data, resulting in money flow stagnating again. Even though this industry is extremely flawed and inefficient, it still manages to rake in hundreds of billions of dollars of revenue each year. Most of that money ends up in the hands of middlemen who display the ads on their websites (Google and Facebook keep almost 73% of the total global ad revenue). Ultimately this hurts both the users and the creators who post their material on these websites. Users suffer by being robbed of their privacy, time and money. Online creators suffer as well since ad money, in most cases, is their main source of income; people avoiding ads on a creators content or avoiding creators content due to excessive ads hurts him either way. Finally even the advertisers suffer as their ads won’t reach the proper crowd, unless they are willing to pay up and advertise on one of the Silicon Valley giants who know how and where to place a product. The facts that user data is illegally tracked, publishers struggle to monetize their content and advertisers are exploited by malicious actors mean that the digital advertising market is in a broken state. A solution for the lack of transparency, non-invasiveness, honest earnings distribution and privacy has been long overdue; a decentralized, transparent digital ad exchange based on the Blockchain technology is required. The BAT token could be the gateway to providing exactly that. BAT is short for Basic Attention Token, which is a blockchain-based digital advertising token. BAT is a necessary element for creating an ad exchange which connects advertisers, publishers, and users in a fair, decentralized manner. BAT is denominated by relevant user attention while removing social and economic costs associated with existing ad networks, e.g., fraud, privacy violations, and malicious advertising. 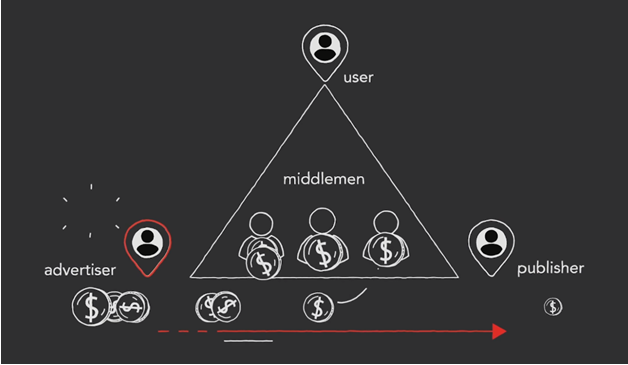 BAT serves as a unit of exchange which cuts out the middlemen from the advertising process. By using this token the system can reward and protect the user while giving better conversion to advertisers and higher yield to publishers. Users get paid for “spending” their attention on watching ads, publishers receive the majority of the ad revenue directly and advertisers spend their advertising money more efficiently (better ROI) and get more accurate data to analyze. The BAT system needs another important component in order to function properly: a web browser. And it is off to a good start as it already has an in-house developed, native browser called Brave. Brave is an open-source, privacy-centered browser designed to block trackers and malware. Behind it is a development team led by Brendan Eich, a man famous for creating Java Script and co-creating Mozilla and Firefox. The team is being advised by Zooko Wilcox, founder and CEO of Zcash, as well as Ankur Nandwani, product manager at Coinbase. The team utilizes blockchain technology to anonymously and securely track which websites users pay most attention to, allowing for publishers to be paid accordingly. It blocks invasive ads and also upgrades the websites you browse on to HTTPS protocol which adds an extra layer of security. The Brave browser tracks both the attention you’ve spent on a website as well as that you spent watching an advertisement. Although having your attention constantly measured doesn’t sound very private, the information that is collected stays completely anonymous. Currently used model of digital marketing has your private data kept in the hands of middlemen who use tracking software to collect it. In the BAT model, you retain ownership of your browsing and your private data; machine learning algorithms will match your data with relevant ads, without having it tied to your identity in any way. According to the incremental time the ad is in view and the number of ad pixels that are visible in proportion to the content you are watching, Brave calculates something called Attention Value for each ad. Brave uses this value as the main indicator for its machine learning algorithm which focuses on teaching the Brave browser how to serve up advertisements that people want to see, leaving both users and advertisers happy with the final outcome. The team argues that their machine learning strategy is much more efficient than those of any third-party tracking systems out there. So far Brave is the only web browser which supports BAT integration. It utilizes the Brave Payments program which allows users to tip websites and content creators (like YouTubers and Twitch streamers) with BAT tokens, providing a Patreon-like service. Your Brave Payments dashboard includes several pieces of useful information such as your account balance, when you’ll receive your next contribution and what websites you’ve been spending most of your time on. 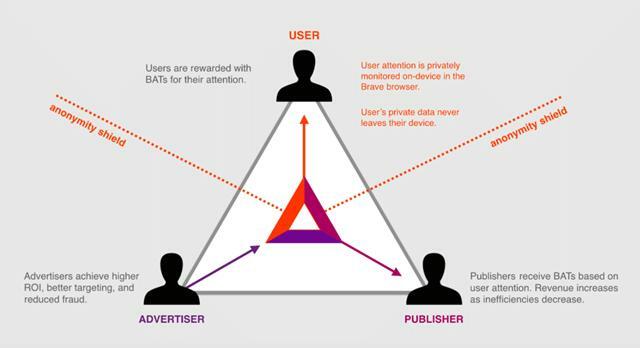 In a future update (Stage 2 of the development) Brave will implement BAT Ads that will pay users in the platform’s cryptocurrency (BAT) for viewing advertisements as compensation for their attention. Users will have the option to opt into the BAT Ads to receive payment for ad watching. Ads from the BAT ecosystem will primarily be displayed to users in “private ad slots” (like an ad tab), and will take the form of rich push notifications, full-page HTML5 content, video, landing pages and more. Ultimately the goal is to create a transparent and efficient Blockchain-based digital advertising market which will fulfill everyone’s needs. Users can spend their BAT tokens on various things in the browser which include donations to content providers or purchasing premium content, high-resolution photos and data services. The BAT system plans on including micropayments for quality comments and voting in forums. As for advertisers, they publish their ads with a token payment in a locked state to users. In order to receive an incremental piece of this payment a user needs to watch this ad. The remainder of the token paid by the advertiser will be distributed among the Brave browser and the publisher who hosted the ad. Brendan Eich himself made a video which explains this process in more detail. The projects whitepaper is also a good source of further information. Finally, the team offers a very detailed roadmap which can be used to learn more about their future goals. Although Brave Software, a San Francisco based startup, is behind the development of both Brave browser and BAT, they plan on allowing other browser companies to utilize the BAT product. Relative to many other blockchain startups, BAT employs a large team of about 30 employees which work on the project development. Over 150 publishers have already partnered with BAT to join Brave Payments, and the list includes such partners as Wikihow, Archive.org, and Smashing Magazine. On March 1, 2018, the company expanded Brave Payments support to streamers on the Twitch.tv platform, signaling a massive step forward in the BAT adoption. 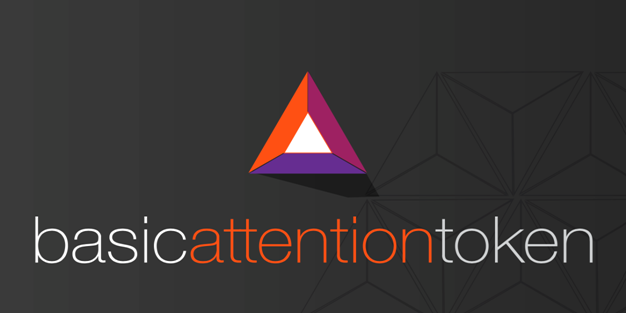 The Basic Attention Token team began working on the project in the fall of 2016. Officially announced in March of 2017, the project held a successful token sale in May, raising $35 million in under 30 seconds. The team caught some flak for this, as the community felt that the tokens were distributed too quickly and to not enough people. In addition to proceeds from the initial coin offering totaling 156,250 Ether, BAT and Brave Software received at least $7 million USD in angel investments from venture capital firms such as Peter Thiel‘s Founders Fund, Propel Venture Partners, Pantera Capital, Foundation Capital and Digital Currency Group. BAT is an ERC-20, Ethereum based token. 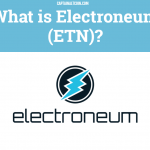 Its transactions are held in a zero-knowledge proof enabled state channel located on the Ethereum network. The total supply of BAT amounts to 1.5 billion tokens, of which 1 billion are currently in circulation. The rest has been withheld by the development team; 200 million tokens are placed in a pool used for product development and 300 million tokens are part of the user growth pool (UGP). The user growth pool is there as an incentive for people to join the BAT network. So far this pool has been used multiple times to stimulate the growth of the user base. 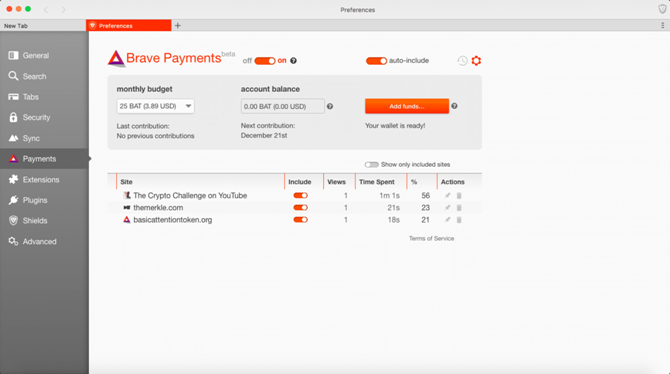 Early adopters of the Brave browser received up to 5 BAT/user that were required to be spent on the Brave platform. If not spent in 6 months, the tokens were taken away from their beneficiaries. Check out this handy guide for full BAT purchasing instructions. The team has discouraged users from trading the coin on exchanges and asked them to spend it on the Brave platform in order to kickstart the economy of the system. Brave browser has a built-in wallet which can be used to store BAT. You can fund this wallet either by sending BAT from an exchange or by depositing ETH/BTC/LTC on it, which will automatically be converted into BAT. As an ERC-20 token, BAT can be stored in any ERC20 compatible wallet. MyEtherWallet is one of those wallets and is generally a great option to store your ERC-20 tokens. BAT can also be stored on a hardware wallet like the Ledger Nano S and is probably the safest way of storing these tokens. Rarely do we see a crypto project possessing a great development team, a straightforward use case and a working product. However, BAT is facing some pretty serious initial hurdles. Getting people to use the Brave browser and getting other browsers to integrate BAT are probably the biggest ones. Another important problem will be bringing publishers and advertisers on board. Shifting users, advertisers and publishers onto a completely new infrastructure might be too hard of a task, especially in a market as entrenched and centralized as the digital marketing one is. The key to a potential change should be in educating a wider base of internet users about the issues that plague the current online marketing system. If enough people realize what are the exact costs of browsing the internet as-is, then Brave could become a mainstream internet browser and BAT could revolutionize the entire market. Otherwise we might be looking at a niche product reserved simply for blockchain enthusiasts. The project does have the fundamentals going for it; it has the talent, the connections, the funding and the product. All the signs suggest that the future will be bright for the BAT project and that you won’t regret becoming a part of that future. 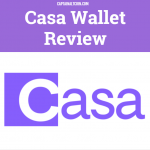 Casa wallet – best HODLing option out there?